Green beans, snap beans or string beans are leguminous crops which means that they belong to a family of plants that have the ability to convert nitrogen from the atmosphere into a form that is stable in the soil. This is very important as nitrogen is one of the most important nutrients for plant growth. 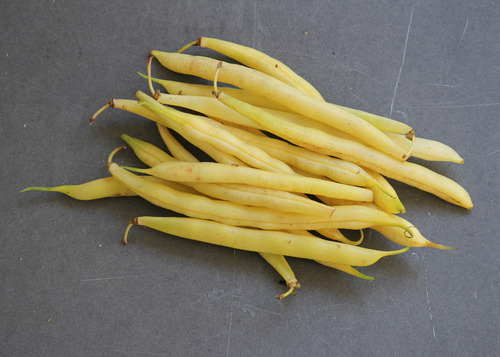 Snap beans are eaten along with their pods unlike shelling beans that are removed from their pods and dried before eating. Snap beans are a warm season crop grown at Sub Edge in July and August. Storage: Snap beans will keep for a week or so in a paper bag in the fridge. Tips: There are many varieties of snap beans of various sizes, shapes and colors. They are all prepared in similar ways. Wash snap beans in cool water and trip stem. All snap beans may be eaten raw or cooked. Eat them raw like carrot sticks with yous favorite dip or cut up and add to salads. Try not to over-cook snap beans, they should be boiled or steamed until they are tender Overcooked beans become mushy and lose their color, flavor and nutritional value. You can cook snap beans with other seasonal vegetables in a stir fry, casserole, stew or side dish.